I went for a long walk last year. My first since marriage, parenthood, middle-age. There have been other solo trips – day walks and the odd weekend – but this was different: a chance to walk without timetables or the need for a swift return; without responsibility for anyone but myself. With the blessing of my family, and my employer, who gave me the month off, I spent October on the loose in the North West Highlands. I knew where I wanted to start. In those intense, joyous, exhausting first years of parenting, I’d occasionally dig out my Ordinance Survey maps and trace a line along the shore of a loch, or over a bealach between two mountains. At the time, it was wishful thinking, but it was also a commitment to future walks. The Corrieyairack Pass was often marked. On the 1st of October I took a train through tidy Perthshire, past ploughed fields and stubble fields, wind turbines on low hills, blades gleaming in the sun. North of Blair Atholl the fields become moors and the hills become mountains. The train’s engine strained as it pulled us over the Pass of Drumochter to the station at Dalwhinnie. A quick hitch to Laggan, and I was walking into the wind, with the mountains ahead; and beneath my feet, under the tarmac, General Wade’s military road. After the 1715 Jacobite Rising, General George Wade was tasked with constructing a network of roads in the Highlands to help enforce the rule of the British State. The most challenging of those linked the barracks at Ruthven in Strathspey with Fort Augustus at the head of Loch Ness. It did so by crossing the Monalaidh mountain range via the Corrieyairack Pass. I followed the road as it skirted a grey loch and then passed through plantation forestry. A red deer stag crossed the road ahead of me, jumping the fence and slipping into the trees – a young one, only a couple of tines on its antlers. I left the road at the same spot and pushed my way through thin spruce until I found a stand of larch on dry ground. I pitched my tent and spent a fitful night beneath trees that surged in the wind. In the morning I passed an estate yard bustling with garages, barns, and Land Rovers. Through the open door of a shed, I saw the body of a stag hung from a hook on a rafter. A ghillie was in there, with his back to me, his attention focused on the carcass. I felt like I was witnessing something profane: the stag upside down, a bucket catching its blood, the ghillie with an apron over his tweeds, busy with knives. I’m sure he would have given a different account, if I’d stopped to ask. I’m sure his relationship to the deer was deeper than mine: sinew deep, bone deep, as he cut through the neck to remove the head. I passed quickly, glad he didn’t notice me. My map was out of date. It didn’t show the construction track for the upgrade of the Beauly-Denny power line, or the new 50m high pylons, marching up and over the Corrieyairack Pass. It didn’t show the compound between Garvamore and Melgarve, with its corrugated sheds and tall fence festooned with blue ‘keep out’ signs, its giant diggers, orange lights flashing, the glare and growl of it all. The compound is close to where a friend is adamant that he had an encounter with the ‘other’. Camped by a pool in the Spey, he got up to pee in the night and saw little silver men, with fat bellies, glowing by the river. Because he was only half-awake, it seemed natural that they should be there. Bewilderment came with full waking in the morning. Whatever he saw – a glimpse of na sìthichean, or just a dream, despite his insistence – it’s unlikely to be repeated, now that the pylons dominate the glen and the compound looms above the pools. A target has been set to increase the proportion of Scotland’s electricity generated from renewable sources to 40% by 2020. Much of that will come from onshore wind-power. The capacity of the existing transmission network is inadequate to cope. Hence the Beauly-Denny upgrade, so that all that power generated in the Highlands can be sent to the Central Belt. The tarmac ends at Melgarve and the old road continues, climbing up into the Corrie Yairack. To walk it is to be aware of the toil of making it: each stone you step on has been dug out of the hill, then lifted and carefully planted; mile upon mile of back-breaking work, in all weather, and for poor pay no doubt. I stopped for a rest and some lunch by a cairn. Looking back, despite the wide strath of the Spey and the Cairngorms rising in the distance, what I saw was the line of antlered pylons. Somewhere on the hill a stag was bellowing, as though he too was affronted. At the top of the pass, at 2500ft, stands an ugly concrete shed. On the rusted door a sign reads: “The safety of men’s lives depends on the equipment stored in this shed.” The shed is a remnant from the first power lines that ran over the pass. I took shelter from the wind and the rain in its lee, then turned my back to Speyside and began the long decent to Glen More and Fort Augustus. The slopes on the far side of Glen More are ornamented with wind turbines, arranged in neat patterns. Beyond them, the mountains of Lochaber and Knoydart were lost in cloud. An 8-wheeled argocat passed me, driven by a young ghillie, who waved. It was followed by a high-spec 4×4 with a cab and open back. I nodded to the driver. There were two figures in the rear seats, the clients, obscured by tinted windows and the steam of air-conditioning. Their stag was sprawled in the back, sodden with rain, its slack head bumping against a wheel arch. The popular image of hunting is of honourable ghillies, practising their craft with skill, respect for tradition, and patient tolerance of the behaviour of their clients; as though it’s they, the ghillies, who ennoble the act and govern the relationship. But really, everyone knows who wields the power. I have a friend whose grandfather worked on a Highland estate between the wars. He was tasked with rowing a party of ladies across a loch to their picnic spot. Because they were fashionable young ladies, they were smoking cigarettes. “You must think it scandalous to see us smoking”, one of the ladies said to the ghillie, who replied, perhaps without thinking, perhaps mischievously, “Och no, we see the tinker wives doing it all the time.” He was dismissed from service later that day. His children’s children remember his perceived insolence with pride. Roads and power cables cross the mountains. This land is not wild land. The upper reach of the Spey, one of Scotland’s finest rivers, has been damned for 70 years, to divert extra water to the Aluminium Smelter at Fort William. The hills bristle with the blades of wind turbines. The deer who roam the hills are a commodity, stocked and then stalked in the shooting season. There are shiny black cars outside the big house on the estate. A spaceport is planned for Sutherland. This is the way of industrial capitalism. This is the way of private land ownership. Of course, it’s complicated. In my month of walking, many of the locals I met and chatted to were in favour of the wind farms, and the fish farms, the hydro stations and the great swathes of mono-crop forestry, and, no doubt, the spaceports. They want jobs, for themselves and their children, that don’t rely solely on the tourist season. And, for sure, given accelerating climate change, wind and hydro are attractive alternatives to coal and gas. I actually like the look of wind turbines: the elegance of their slow, enormous turning, especially when there’s a group of them, like choreographed dancers, or those whirling Sufi mystics. And it still seems a thing of magic to me, that the simple rotation of a turbine, driven by wind or water, can power a civilisation. The bigger question is not to do with aesthetics, jobs, or ownership; it’s to do with whether this is tenable. Whether a system that relies on ever more industrialisation and extraction, can be, or should be, sustained. I camped by the bridge at Lagan-a-bhainne, then followed the road as it curved round and down the steep southern side of Glen Tarff. Thickets of birch and rowan glowed in the morning sun. The wind turbines and the pylons were out of sight, and the glen looked as it might have when redcoat soldiers marched through, or when drovers used the pass long before General Wade pitched up. This section of the road is grassed over, wild-flowers grow in its verges, it flows with the contours of the glen. Below me, by the river, a sparrowhawk glided from one thicket to the next. Really enjoyable read. Very engaging with good observations well-made. I am pleased to find another person who finds wind turbines aesthetically pleasing. I think they are elegantly graceful and rather enjoy seeing ones on treks in the hills. Thanks Alasdair. I guess the question is one of scale and location — I wouldn’t want to see them everywhere. Thoroughly enjoyed your excellent adventure……well written too…..I lived in Fort William and Aberdeenshire for some years …..these areas are just so beautiful but are and have been, a magnet for the aristocracy and their friends….. I also think wind farms are acceptable particularly if they are ranged near mountains….The Ox mountains in North West Ireland give a good example of a striking view of these useful power creators. The road which was built to facilitate the construction of the new pylons cost millions, it was built to prevent any damage to the Military Road & has now largely been removed at great expense & the land restored as the pylons will be serviced by helicopter. The Military Road itself hasn’t been maintained since the 1830’s & was in a terrible state, one adventurous 4 x 4 driver was killed trying to cross it! A quid pro quo from the Beauly-Denny has ensured the restoration of the road at considerable expense, by a local contractor who was doubtless glad of the work & spent the best part of a Summer up the pass. The compound you describe is the substation required to step-up the turbine power to the grid. Half the proposed turbines will be used to power green-steel production at Dalzell & help power the Lochaber Smelter in dry Summers like this one! The rest will go to lighting folks hooses & making their dinners. What remains of the contractors road will also be removed after the unsightly blocks of conifers have been harvested & the timber extracted from the glen, again these activities are denied the use of the Wade Road. The soldiers who built the road over the pass had double wages, they weren’t conscripted. Deer may be stalked in season but are wild animals & not stocked! they have a better life than farmed animals by a long chalk. Possibly however, meat offends you, you don’t use electricity & don’t fancy a proper job in industry or have any use for steel/aluminium. You might then have a valid complaint! Hi Wullie, I hope the article comes across as being a bit more nuanced than simply being anti-electricity, anti-jobs. In fact, I pointed out that most of the locals I met on my walk had a positive attitude towards development, and that renewables are a vital alternative to fossil fuels. However, there remains a valid question about the industrialisation of the landscape, and whom that profits, and behind that, the deeper question of our relationship to the land and to the other creatures we share it with. One of the other things I noticed on my walk was just how many hydro systems are now installed in our burns and rivers. None of them ‘bad’ in themselves, but I wonder at the balance. When every hill has its turbines, every river is dammed, every loch fish-farmed, what will it say about our stewardship of this particular chunk of the planet? And I don’t ask this from some ivory tower. We’re all complicit, we’re all trying to figure out what makes sense in a time when the consequences of our assault on the environment are now blatant, and accelerating; and I’m sorry, but I don’t share your faith that the likes of Liberty House, and their ‘green steel’, really have our best interests at heart. The “industrialisation of the landscape” narrative deserves to be closely interrogated. It seems to me to be a romantic one serving questionable ends. I’m not sure that it is one that Norwegians would recognise or have much sympathy with. They have built their success on dispersed industrialisation. That is how they have been able to maintain healthy populations in rural areas. Highland landscapes have been subject to a range of processes which could be described as industrial over the centuries, including the large-scale felling of forests to provide fuel for iron furnaces in the 18th Century, the management of oak woodland to serve the tanning industry, the creation of huge sheep walks, regimented commercial forestry, and now the intensive management of moorland for grouse shooting. Looking to the future, I believe that land reform and the bringing together of the resettlement and rewilding agendas can help to rebuild a sustainable and diverse economy in Scotland’s upland areas. I’d certainly agree with that vision of the future. Here’s to it! The problem with wind turbines, other than aesthetics, is the relationship between the landowner and the power utility company. Who benefits? Not local people. It’s a free for all and the regulation and strategy is poor. Good piece of writing. Just nonsense, the former landowner Rio Tinto intended to close the Lochaber Smelter, regardless of the disastrous effects for Fort William, the new owner Liberty House has saved the smelter, intends to build an alloy wheel plant alongside it for added value & is putting the Kinlochleven hydro scheme back in full production. The new turbines will facilitate this. Smelter operators, steel workers & estate workers & contractors, it’s all about jobs for Scots! ‘This land is not wild land.’ A short statement but profound in its implications and one that could be applied to much of the highlands . The landscape is an artefact created by human activity over millennia and continues to develop in response to new human activities . ‘Rewilding’ is perhaps an emotional response to some of the changes but does not always do justice to the complexity of landscape history. What would you feel about reintroducing wolves, then? Personally, I think it’d be a remarkable thing to do — to allow space for creatures that were once an integral part of the ecology of Scotland. But I don’t think socially, politically, or practically (in terms of land management), we’re in a place to do so; and I’m not sure we will be in my lifetime. Never mind wolves, look at how many raptors, mountain hares, and other creatures, are killed because they are an inconvenience. Liberty House are the successors to the British Aluminium Company who have been using Hydro Power resources, creating employment & keeping families in the Highlands since 1894. 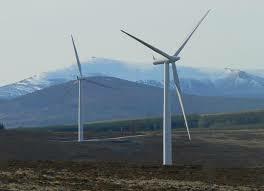 Where are these turbines you speak of on the burns on that particular estate? for “every burn” read “none!” for there are none! but don’t let that spoil the narrative! Without the BA’s Highland aluminium Britain could well have lost the war! Their employees had electric light when other folk were using Tilly lamps. The “metal march of pylons” is nothing new, those on the Corrieyairack replace the line built in the 1950’s, visually they don’t really look any different & the route has been varied quite a bit for environmental & scenic considerations. The Beauly/Denny has been a magnificent achievement, a triumph of civil engineering & the guys who worked on top of these pylons, on top of that pass should have got medals not brickbats from the usual cranks! Wonderfully evocative piece of writing.